This has to be some kind of record. 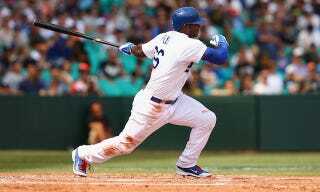 The Los Angeles Dodgers are just two official games into the season, and the Los Angeles Times' Bill Plaschke has already fired off his first "Yasiel Puig is tearing this team apart!" column of the year. It doesn't make any damn sense. It's one thing to foolishly run into an out when you're hitting .350, or mindlessly overthrow a cutoff man when you've already thrown out two guys in the same game. It's another thing to do the same dumb stuff when you're not the same great player. Puig batted .214 in the season's last month while showing an increasing inability to hit the inside pitch. After rebounding to hit .471 against the Atlanta Braves in the first round of the playoffs, he then batted .227 against the St. Louis Cardinals in the National League Championship Series with 10 strikeouts in 23 plate appearances while make a couple of gaffes in the field. This spring, he barely showed up, managing only five hits. Then, in Australia, he went 0 for 5 with three strikeouts in the opener before collecting three hits with two runs batted in during his baserunning-marred second game. One of the reasons Mattingly commands so much respect in the clubhouse and the community is that he's so real. But in talking about Puig, he almost sounded rehearsed, and one wonders if he was asked to chill out by the highest levels of the Dodgers front office—a place that uses Puig's signing as a point of pride and continually protects and empowers him. One certainly does wonder, doesn't one? One also wonders if Yasiel Puig is actually an alien from space. One wonders if the JFK assassination was actually orchestrated by Yasiel Puig, who traveled back in time and shot Kennedy from the grassy knoll in order to wreak as much havoc on American culture as possible. One wonders if Yasiel Puig stole all the Bitcoin. One wonders why the hell Bill Plaschke still has a job.